Recently the ice2ice article Risebrobakken, Bjørg, and Sarah Miche Patricia Berben. “Early Holocene establishment of the Barents Sea Arctic front.” Frontiers in Earth Science 6 (2018): 166 was published in Frontiers Earth Science. You can find the full article here. Below a short summary by the two ice2ice authors Bjørg Risebrobakken and Sarah M. P. Berben from Uni Research Climate, Bjerknes Centre for Climate Research, Bergen, Norway and Department of Earth Science, University of Bergen, Bjerknes Centre for Climate Research, Bergen, Norway, respectively. A main feature of the Barents Sea oceanography is the Arctic front. The Arctic front marks the transition between the dominating water masses of the Barents Sea: Atlantic Water in the south and Arctic Water in the north. Presently, the Barents Sea Arctic front is directed by the topography of the Bear Island Trough and to some degree the location of the sea ice boundary. During the last glacial maximum, the Svalbard-Barents Sea and Scandinavian Ice Sheets covered the Barents Sea. Hence, no water entered the Barents Sea, neither from the south nor from the north. Following the deglaciation of the Barents Sea, the present-day ocean circulation developed. The evolution of how the present location of the Barents Sea Arctic front established during the early Holocene is documented by foraminiferal relative assemblage data from six core sites along the western Barents Sea margin and opening. The relative abundance of Arctic front indicator Turborotalita quinqueloba, in combination with the cold, polar Neogloboquadrina pachyderma and warm, Atlantic Neogloboquadrina incompta, are used to infer the location of the Barents Sea Arctic front relative to the individual core sites. Figure 1. (A) Main features of present-day surface to subsurface oceanography of the northern Nordic Seas and the Barents Sea. NSAF: Nordic Seas Arctic front. BSAF: Barents Sea Arctic front. BIT/BSO: Bear Island Trough/Barents Sea Opening. BI: Bear Island. Red arrows: Atlantic Water currents. Dark blue arrows: Polar Water currents. Atlantic Water is found south of the BSAF, Arctic Water is found north of the BSAF. In the Northern Barents Sea, Atlantic Water is found at the subsurface, underneath the Arctic Water. (B) Location of the investigated cores. The color of the star marking the location is defined by the dominant planktic foraminiferal species (dark blue: N. pachyderma; light blue: T. quinqueloba; red: N. incompta; black: G. uvula; light grey: other species) of each individual site during the different time intervals (B1: 12-11 ka BP. B2:11-10.2 ka BP. B3: 10.2-8.8 ka BP. B4: 8.8-7.4 ka BP. B5: 7.4-0 ka BP). The light blue stippled line indicates the location of the BSAF during the different time intervals represented by B1-5. (C) Relative abundance of planktic foraminifera at the investigated sites over the last 12 ka BP. The color coding for the species is the same as in B. The stippled white lines indicate the transition phases between the time intervals of B1-5. The white dots at the bottom of each panel indicate the tie-points for the age models that are within the 0-12 ka BP interval. Until ca. 11 ka BP, the Barents Sea Arctic front followed the western margin of the Barents Sea. All sites along the Barents Sea margin where still dominated by Arctic Water between ca. 11 and 10.2 ka BP, however, the Barents Sea Arctic front turned eastwards into the southwestern Barents Sea. From ca. 10.2 to 8.8 ka BP, the Barents Sea Arctic front moved eastward and was located right above most sites as it followed the Barents Sea margin. The northwestern Barents Sea Arctic front was close to the present location from ca. 8.8 to 7.4 ka BP, however, it was still confined to the southwestern Barents Sea. From ca. 7.4 ka BP, the Barents Sea Arctic front has been located close to the present position, along the margin southwards from Svalbard, turning eastwards along and beyond the northern Bear Island Trough margin. Our new publication led by Emma Kahle (University of Washington) deals with the technical challenges the new continuous melting techniques for water isotope analysis have introduced to the study of the firn isotope diffusion. 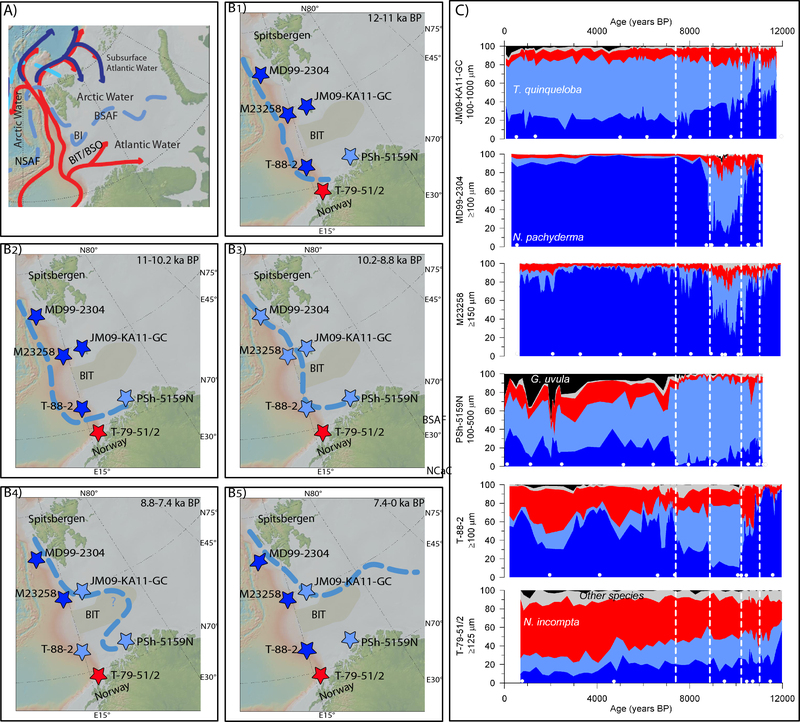 Improvements in precision and resolution have resulted in sizeable effects that hinder our ability to accurately infer diffusion lengths from high resolution water isotope records. In this paper we consider various new approaches for describing the power spectral densities of high resolution data sets and discuss their implications for temperature reconstructions based on firn isotope diffusion. 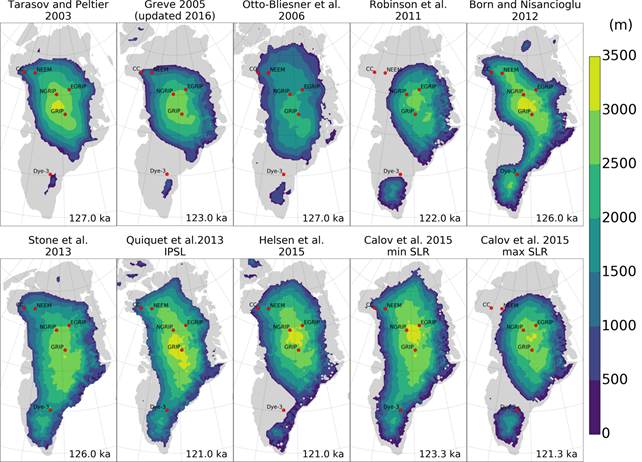 Diffusion of water vapor in the porous firn layer of ice sheets damps high‐frequency variations in water‐isotope profiles. Through spectral analysis, the amount of diffusion can be quantified as the“diffusion length,” the mean cumulative diffusive displacement of water molecules relative to their original location at time of deposition. In this study, we use two types of ice‐core data, obtained from either continuous‐flow analysis or discrete sampling, to separate diffusional effects occurring in the ice sheet from those arising through analytical processes in the laboratory. In both Greenlandic and Antarctic ice cores, some characteristics of the power spectral density of a data set depend on the water‐isotope measurement process. Due to these spectral characteristics, currently established approaches for diffusion estimation do not work equally well for newer, continuously measured data sets with lower instrument noise levels. We show how smoothing within the continuous‐flow analysis system can explain these spectral differences. We propose two new diffusion‐estimation techniques, which can be applied to either continuously or discretely measured data sets. We evaluate these techniques and demonstrate their viability for future use. The results of this study have the potential to improve climate interpretation of ice‐core records as well as models of firn densification and diffusion. What’s wrong with the bipolar ocean seesaw hypothesis? The thermal bipolar ocean seesaw hypothesis was proposed by Stocker and Johnsen (2003) as the ‘simplest possible thermodynamic model’ to explain the time relationship between Dansgaard-Oeschger (DO) and Antarctic Isotope Maxima (AIM) events. Following the Bergen ice2ice MIS3/Southern Ocean and Bipolar Seesaw Workshop a group of ice2ice researchers and some international collaborators were invited by Quaternary Science Reviews to write a review on the thermal seesaw. The resulting paper, “Beyond the bipolar seesaw: towards a process-understanding of inter-hemispheric coupling” by J. Pedro, M. Jochum, C. Buizert, F. He, S. Barker and S. Rasmussen, is now live and open access at QSR. Compensating heat transports: Changes in Atlantic heat transport invoked by the thermal seesaw are compensated by opposing changes in heat transport by the global atmosphere and the Pacific ocean. This compensation (which would come as no surprise to Vilhelm Bjerknes) has a decisive influence on the spatial pattern of climate anomalies. Changed ocean heat transport strongly affects sea ice, triggering ice-albedo feedbacks that dominate the high-latitude climate response. Changed atmospheric heat transport alters the position and intensity of the Hadley circulation and of atmospheric jets and eddies, dominating the response at low to mid-latitudes. A global ocean—not Southern Ocean—heat reservoir: According to the thermal seesaw hypothesis, the Southern Ocean acts as a heat reservoir during the DO/AIM events, integrating changes in South Atlantic temperature. We dispute this because South Atlantic temperature anomalies spread much more efficiently into the Indian and Pacific Ocean, by Kelvin and Rossby wave processes and by advection, than they do into the Southern Ocean. This is because the Southern Ocean has no zonal boundary to support waves and because the Antarctic Circumpolar Current (ACC) prohibits advection, since by definition the flow is along the current’s axis. In coupled model simulations the heat content of the Southern Ocean shows very little change during the DO/AIM events; instead, the global ocean north of the ACC better fits the description of heat reservoir. Wind-driven thermocline deepening: In the conventional thermal seesaw, a collapse of the AMOC causes heat that would otherwise be advected north to accumulate in the South Atlantic. In our coupled model experiments, a southward shift of the ITCZ accompanies northern high latitude cooling (as commonly seen in previous studies). The ITCZ shift and associated changes in wind stress over the South Atlantic gyre deepen the thermocline there, such that abrupt South Atlantic warming results from reduced northward advection coupled to the wind-driven deepening of the thermocline. The thermocline deepening is essential in enabling heat to be stored at depth rather than released to the atmosphere through the Ekman layer. Atmospheric heat transport warms Antarctica: Antarctica warms during AIM events due to an increase in poleward atmospheric heat and moisture transport following sea ice retreat and surface warming over the Southern Ocean. The sea-ice retreat is itself driven by gradual eddy-heat fluxes across the ACC that initiate sea ice melt and are amplified by sea-ice albedo feedbacks. The centennial lag of Antarctic warming after AMOC collapse (WAIS Divide Project Members, 2015) reflects the time required for heat to accumulate in the global ocean interior before it can be mixed across the ACC by eddies and trigger the sea-ice feedback. For the nitty gritty, including our full assessment of the Antarctic and Southern Ocean energy balance during AIM events, please do refer to the paper. In the spirit of ice2ice the review was a collaboration between ice-core (Buizert, Rasmussen, Pedro), sediment core (Barker) and modelling (Jochum, He) specialists. I’m grateful to all these coauthors for their excellent (and diverse!) inputs and to ice2ice for the support throughout, including for the MIS3/Southern Ocean and Bipolar Seesaw Workshop that kicked this effort off. Stocker, T.F., Johnsen, S.J., 2003. A minimum thermodynamic model for the bipolar seesaw. Paleoceanography 18, 11-1. Pedro, J. B., Jochum, M., Buizert, C., He, F., Barker, S., Rasmussen S.O., Beyond the bipolar seesaw: Toward a process understanding of inter-hemispheric coupling. Quaternary Science Reviews (in press), https://doi.org/10.1016/j.quascirev.2018.05.005, 2018. WAIS Divide Project Members, 2015. 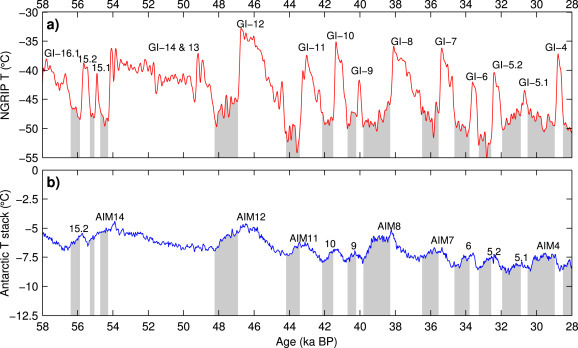 Precise interpolar phasing of abrupt climate change during the last ice age. Nature 520, 661-665. Team Bergen is getting ready for Greenland, are you? If you drive about 1.5 hour east of Bergen, you reach Jondal, a small village in the Hardangerfjord with the scenic Folgefonna glacier in the background. Folgefonna glacier is the third largest glacier in Norway and was going to be our office for the next three days. 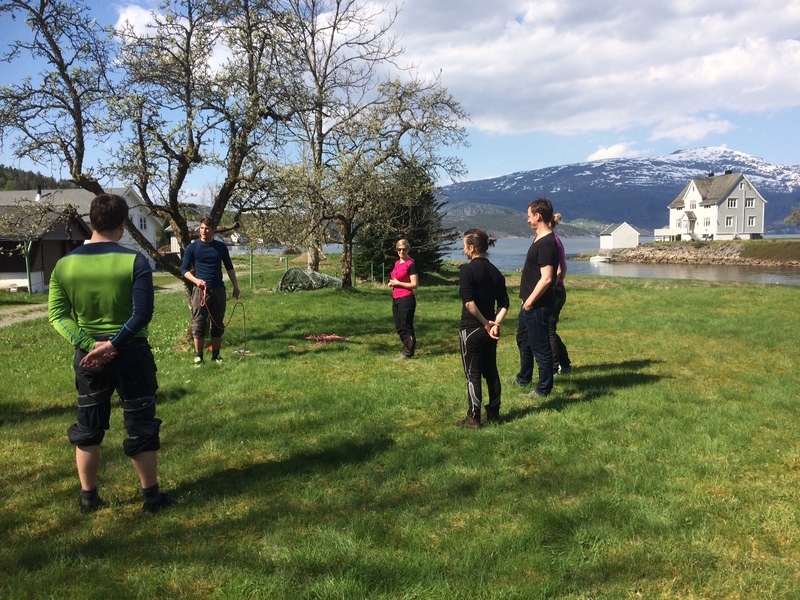 The course started down in warm and sunny Jondal where we practiced on different pulley systems and knots. Afterwards we hiked up to the glacier for a small taste of what was to come. 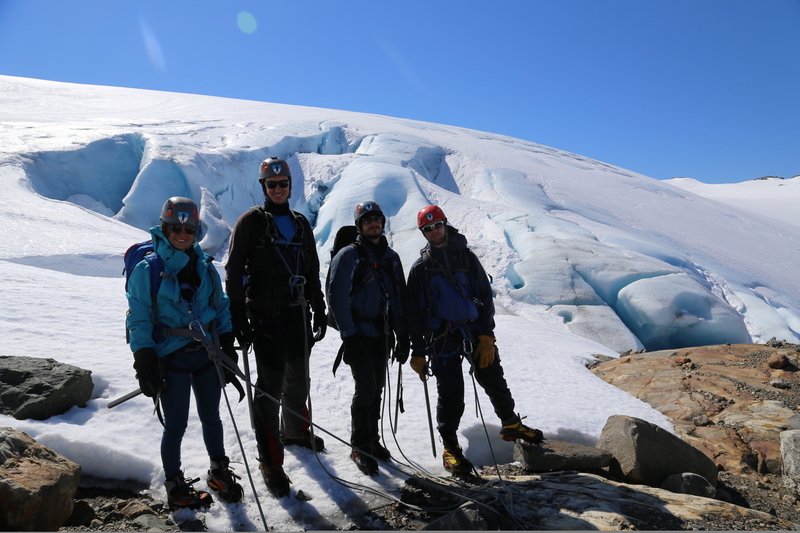 Most of the second day was spent on the glacier and we practiced walking in rope teams and on the pulley systems we had learned down in Jondal the day before. However, now we faced harsher weather conditions, perfect for testing our skills under pressure. 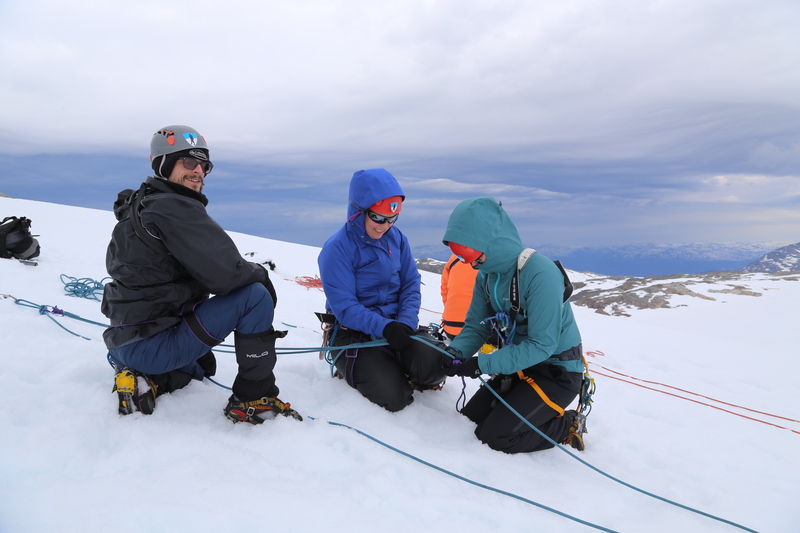 On the top of a small hill we divided in teams and practiced on using the pulley systems to pull a team member up a steep slope, imitating a crevasse. In the evening, back in Jondal, we went through some techniques on rescuing injured people down from a glacier. The last day the sun was shining (let’s be honest, I think all of us got a sunburn) and up on the glacier we practiced on our navigational skills using maps and GPS. The afternoon was spent at the shooting range down in Jondal. 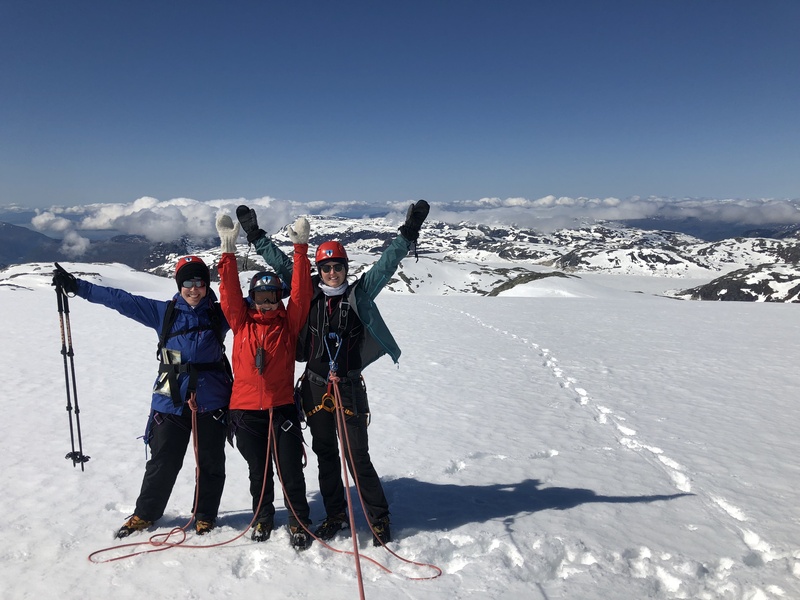 Petra, Margit and Sunniva on the top of the Folgefonna glacier. Thank you to our guides Snorre and Lars Petter (Folgefonni Breførerlag) and to the Ice2Ice project for arranging the course. Can our combined knowledge of past abrupt changes provide lessons for the future? 20 ice2ice researchers with varying backgrounds and ‘seniority’ met in Copenhagen to discuss to what extent the combined ice2ice knowledge of past climate change is relevant for future climate scenarios. 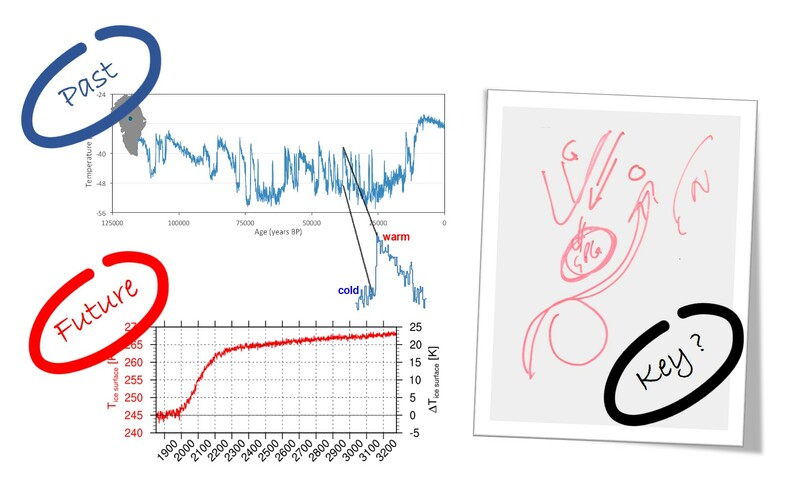 With input from modellers and proxy data experts, the very interactive workshop featured presentations and discussions of proxy data reconstructions, paleoclimate modelling efforts, and future model projections focusing on sea ice related warming near Greenland. The program was split into three sessions – leading to a step-by-step assessment of similarities and differences between the past and potential future conditions. Below are some headlines from the sessions, along with the summary with notes and plans for future work (if you are part of ice2ice you can find these in the dropbox). Magnitude of past Greenland warming in proxy data and paleo modelling efforts are similar (10 K), but rate of change is higher in models compared to proxy records. The dynamics and properties of the present/future Arctic Ocean and past Nordic Seas have similar features, but there might smaller differences that are of key importance. Greenland is sensitive to ice loss in “the vicinity”, but the atmospheric response to sea ice loss is highly sensitive to the location (and magnitude) of ice loss. The paleo mechanism(s) could in principle apply in a future, Arctic Ocean setting. This does, however, require further investigation. The potential for future abrupt sea ice loss can be assessed by testing concrete ice2ice hypotheses explaining the past abrupt (D-O) sea ice loss. Silje has commented to the Norwegian media Storm on the origin of ice bergs in the central Arctic. You can find the full article here (in Norwegian). Ice2ice researcher Christian Rodehacke is co-author on a new article in The cryosphere investigating different models of Greenland ice sheet and how they compare. 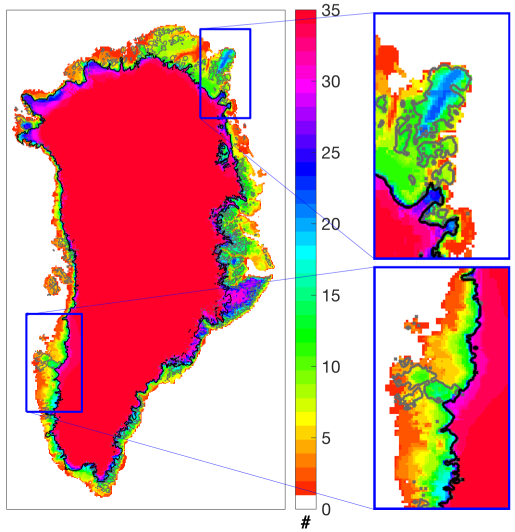 We have compared a wide spectrum of different initialisation techniques used in the ice sheet modelling community to define the modelled present-day Greenland ice sheet state as a starting point for physically based future-sea-level-change projections. Compared to earlier community-wide comparisons, we find better agreement across different models, which implies overall improvement of our understanding of what is needed to produce such initial states. Goelzer, H., Nowicki, S., Edwards, T., Beckley, M., Abe-Ouchi, A., Aschwanden, A., Calov, R., Gagliardini, O., Gillet-Chaulet, F., Golledge, N. R., Gregory, J., Greve, R., Humbert, A., Huybrechts, P., Kennedy, J. H., Larour, E., Lipscomb, W. H., Le clec’h, S., Lee, V., Morlighem, M., Pattyn, F., Payne, A. J., Rodehacke, C., Rückamp, M., Saito, F., Schlegel, N., Seroussi, H., Shepherd, A., Sun, S., van de Wal, R., and Ziemen, F. A.: Design and results of the ice sheet model initialisation initMIP-Greenland: an ISMIP6 intercomparison, The Cryosphere, 12, 1433-1460, https://doi.org/10.5194/tc-12-1433-2018, 2018.